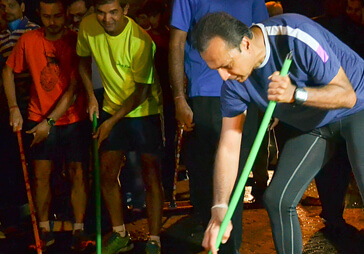 Reliance Group Chairman Shri Anil Dhirubhai Ambani was among the first nine individuals called upon by Prime Minister Narendra Modi to be a torch bearer for the Swachh Bharat Abhiyan (Clean India Campaign) when it was launched on 2nd October, 2014. Mr. Ambani responded to this stellar cause immediately, engaging fellow members of his Runner's Club and taking to the streets of Churchgate in downtown Mumbai on 8th October. 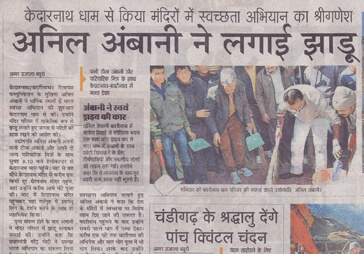 "I am honoured to be invited by our respected Prime Minister Shri Narendrabhai Modi to join the Swachh Bharat Abhiyan. I dedicate myself to this movement,"
he said in an address. 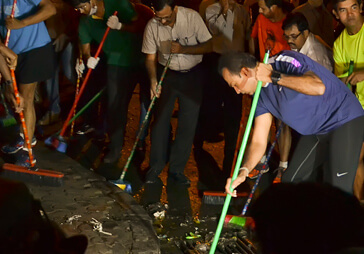 He also nominated nine other Indians to take the Clean India message forward including actors Amitabh Bachchan, Hrithik Roshan and Nagarjuna, sports legends Mary Kom and Sania Mirza, noted novelist and columnist Shobha De, journalist Shekhar Gupta and lyricist Prasoon Joshi. Committed to the cause, the very next week, he took the broom in his hands to clean the area around Badrinath and Kedarnath temples. After cleaning the premises and the surrounding area, he said, “Today, I am here for two important reasons. 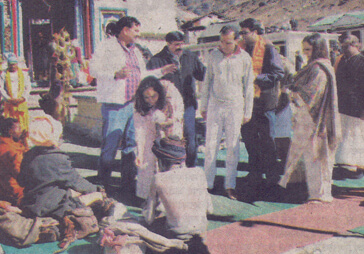 First, to take the blessings of Badrinath ji and Kedarnath ji and second important reason that I would like to share with you is, we do not keep our temples and places around it as clean as they should be. 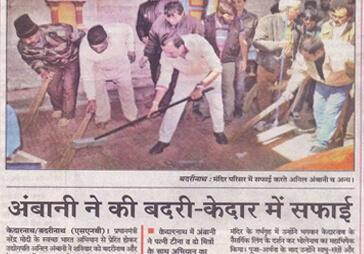 So let us all take this responsibility from today, to keep our religious places clean." Mr. Ambani continues to devote his time and energy for the cause and has taken up numerous initiatives at local, state and national levels to drive the campaign forward. Click here to read more such stories about our Chairman and senior management and why they inspire us to reach new heights.